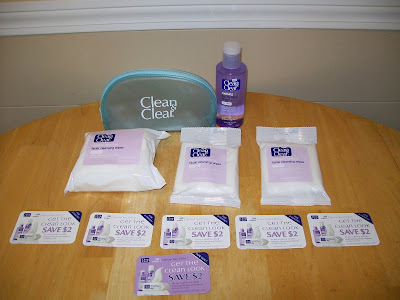 Frugal & Fabulous: Free Clean & Clear products! Free Clean & Clear products! Woohoo! A box full of Clean and Clear was waiting for me yesterday when I got home. I have been selected for my first Bzz Agent campaign!!!! psst! Have you entered my M. Avery Designs Shouder Bag giveaway yet? If not, please do! My daughter uses Clean and Clear and it works great for her face. Tomorrow, on my Thrifty Thursday post I give you a special shout out! I should be receiving this same package any day now. i signed up last week...hope i get picked for something!!! How perfect, there is a C&C deal at CVS this week (I think its CVS). $5 ECB wyb $15 worth. With those coupons you might just get them for free!